Livia Versini-Campinchi is a Political Science student from France at CCSF, graduating in Spring 2017. Taking pictures is a hobby she got from her dad, who takes the most beautiful pictures. She took Chance in Paris, her hometown, in 2013. Do I have you, or do you have me? Good evening, friends and family! Welcome to our penultimate Forum Lab. The magazine is coming along well, with the proofs just about ready and the acceptance letters being written as I type. Keep an eye on this space for announcements about the launch party at the end of May– I promise, it’s coming soon! The other major topic tonight was our class presentations on other literary magazines, ft. Poetry Editor Kevin C. giving us the history of seminal pulp mag Weird Tales and Poetry Reader C S. introducing us to three magazines: The Moth, a top-notch Irish magazine, The Hoot Review, postcards from the literary dimension, and The Caterpillar, literary writing from adults for kids. Alex enjoys some delicious treats provided by the ever-gracious C.
Today’s writing prompt is inspired by C’s presentation! The Hoot Review publishes poetry and “microfiction” that can fit on a postcard– try your hand at writing short flash fiction or poetry that is 150 words or less! 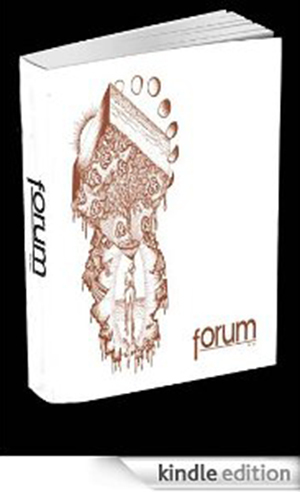 Whenever you write a poem, story, take a picture, or create a piece of artwork based on these prompts, you can post it in the comments or submit it to submissions@forumccsf.org for consideration on the Forum Magazine Blog. Make sure to follow all submission guidelines and in the subject line include “Writing Prompt Wednesday”. In the body of the email, please include the writing prompt you used for your piece. Hey everyone! I know we took a bit of a sabbatical last week (Forum Lab was canceled because Professor Young had the flu– happily she’s much better now), but I definitely missed y’all. Here are a couple of photos from yesterday’s lab, where we wrestled with the final proofs, talked about grammar, and tried to obey Graphics’ directives about cutting some pages. Y’all, we got so many awesome submissions the editors and readers loved that Graphics had to ask us to cut 20-40 pages! So, you know, if you submitted something and it didn’t get in, keep in mind that there was a ton of amazing competition and we definitely want you to try again in the Fall. On to the writing prompt! I’ve seen some amazing quotes for National Poetry Month, but I think this one, from G.K. Chesterton’s essay Cheese, has to be one of my favorites. Pick up a back issue of Forum and talk to creative writing faculty about our course offerings and Creative Writing Certificate! We’re also starting work on some group projects reviewing other literary magazines, because professional development is important. I know we all learned a very rigid definition of the form when we were in grade school– a three line form with the format of five syllables/seven syllables/five syllables. If you pick up any book of joke haiku, you’ll see this impulse at work. There are other traditional haiku rules that we don’t talk about as much– writing in the present tense, a “season word,” (kigo) which is a nature image specifying the time of year. Still, many modern poets writing haiku break with the traditional formats– modern haiku, especially, are increasingly unlikely to follow the tradition of 17 syllables or to take nature as their subject. But the essence of haiku is the juxtaposition of two images or ideas with a kireji (cutting word) or caesura between them, a verbal or visual punctuation mark signaling the moment of separation and relation.